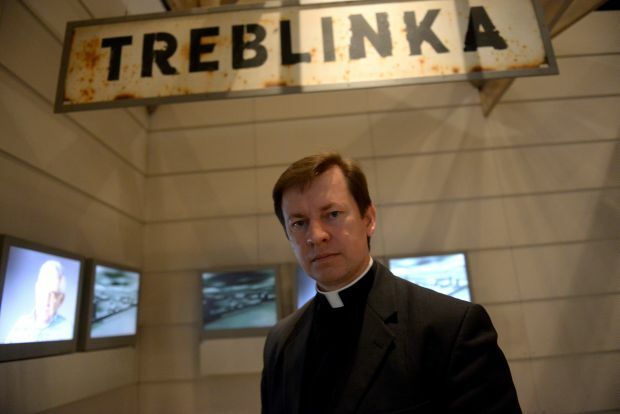 JERUSALEM (CNS) — The Nazis’ Treblinka concentration camp has always been a part of Father Pawel Rytel-Andrianik’s life. Growing up in the shadow of the camp, located just three miles from his home in northeastern Poland, Father Rytel-Andrianik, now 37, would listen to his grandfather’s account of his eight-month imprisonment there and how he contracted typhus under inhumane conditions. The priest’s grandfather, Stanislaw Rytel, was jailed for failing to collaborate with the Nazis, ultimately to be saved by a friend and fellow prisoner, who convinced camp guards that Rytel was his brother and his labor was needed to build a new barrack at the camp. Such stories have inspired Father Rytel-Andrianik to learn more about people who risked their lives to save Jews and others during Europe’s Nazi era. Father Rytel-Andrianik, professor of Scripture at the Pontifical University of the Holy Cross in Rome, is collecting the stories and building lists of names of average people, priests and nuns who risked their lives to save Jews. In 2011, he published a book about the heroic acts of Poles protecting Jews, “I Will Give Them an Everlasting Name (Isaiah 56:5) Poles Savings Jews in the Area of Treblinka.” It was written in Polish with Hebrew and English summaries. The priest spoke with Catholic News Service in April in Jerusalem, where he regularly visits the Yad Vashem Holocaust Martyrs and Heroes Remembrance Authority and interviews Holocaust survivors. Working with a small team of researchers, the priest recently completed the Priests for Jews project, with support from the U.S. Conference of Catholic Bishops’ Subcommittee on the Church in Central and Eastern Europe and the Saeman Family Foundation. He discovered the names of 1,000 priests who saved Jews from certain death. The completed project is scheduled to be finished by the end of 2014 and will include a book and a website with archival documents and firsthand testimonies. He also is compiling a list nuns who helped saved people, building on the work of Polish researcher Ewa Kurek, whose own research uncovered that nearly two-thirds of the 85 women’s religious communities in 360 convents in Poland during World War II were engaged in rescue work. Father Rytel-Andrianik said the Auschwitz concentration camp in southern Poland is better known than Treblinka, because all that remains of the second camp is a 26-foot memorial in Poland’s northeastern forest. “This is the atmosphere I grew up with. I always wanted to know more and more about what happened in Treblinka. I read and listened. My mother always reminded me that I was given a life because someone saved my grandfather’s life,” he said. Father Rytel-Andrianik is driven by a sense of indebtedness to the man who saved his grandfather’s life and the thousands of others who risked their lives to protect Jews. At first he wanted to record the brave acts of Poles who dared defy Nazi rule. His work led him to discover that many Polish nuns and priests — among them some he knew as a child — also rescued Jews. The priest said he wanted to highlight the good that existed in people in the darkest times of World War II, when it seemed that God was absent. “The Holocaust shows what humanity can do with the exclusion of God,” he said. Of the 16,000 priests in Poland during World War II, 4,000 were imprisoned not only for helping Jews but also for a variety of violations of Nazi law, Father Rytel-Andrianik said. About half of the clergy were killed in the camps, according to his research. Father Sztark and Sister Maria Marta, superior at the convent, and Sister Maria Ewa, a medical doctor, provided food and money to Jews, issued false baptismal records, urged parishioners to help their Jewish neighbors and hid Jewish children in the convent. They were executed along with thousands of Jews in December 1942. The priest was surprised to discover that 100 people who lived near Treblinka have been recognized as Righteous Among the Nations. Despite such heroic actions, anti-Semitism was strong in Poland, and questions have been raised about the reliability of the numbers of priests and religious who protected Jews. In an article published in 2000 in the journal Yad Vashem Studies, historian Dariusz Libionka of the Polish Center for Holocaust Studies cited the strongly anti-Semitic 1936 pastoral letter of Cardinal August Hlond as an example. The letter accused Jews of being “free-thinkers, atheists and Bolsheviks,” and of having a “disastrous effect on morality.” In addition, Libionka noted that, unlike communications from the bishops of other occupied countries, the communications from Polish bishops to the pope made little mention of the annihilation of the Jews. In the introduction to Father Rytel-Andrianik’s 2011 book, Brandeis University Holocaust scholar Antony Polonsky wrote that the accepted number of 20,000 Jews who survived on the “Aryan” side should be doubled or tripled, which would also indicate more rescuers than previously believed. Havi Dreifuss, director of the Center for the Study of the Holocaust in Poland at the International Institute for Holocaust Research at Yad Vashem, told CNS that interest has risen in trying to find people who helped Jews in Poland. She cautioned that such research must be conducted carefully. “Jewish-Polish relations in general and with segments of (the) priesthood are very complex,” Dreifuss said, adding that she was not familiar with Father Rytel-Andrianik’s work. “Today we can say that the vast majority of Polish society was quite indifferent to the suffering of the Jews during the Holocaust as they were quite occupied with their own suffering under German occupation. “There was a small portion of Poles who helped and they were from all parts of Polish society … priests and nuns for sure were among them. Things were so complicated it is very difficult to assess today what happened,” she said. Father Rytel-Andrianik said although some people believe that priests did not do enough to oppose the Nazis, he believes many priests did more than is known.